KPMG provides Board members with a resource to keep abreast of current and emerging issues offering thought leadership on trends and current topics. 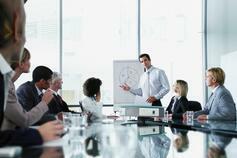 The board plays a critical role in shaping an organisation's corporate governance. The board of Directors plays a critical role in shaping an organisation's corporate governance framework. Now more than ever, Boards are required to ensure there are appropriate mechanisms in place to not only protect shareholder interests but to enhance the long term performance of the organisations they govern. KPMG in Bermuda provides Board members with a resource to keep abreast of current and emerging issues offering thought leadership on trends and current topics which would interest Board members. KPMG in Bermuda provides a range of resources including publications, topical forums, seminars and roundtables to host the exchange of views and insights on board and governance leading practices and processes, and other topics of interest to board members. 8 things boards should keep in mind as they consider and carry out their 2017 agendas. 7 items for boards to consider in 2017.